Shipping group Maersk said on Thursday 94 companies and organizations have so far joined a blockchain platform developed with IBM aimed at boosting efficiency and limiting the enormous paper trail of global container shipping. 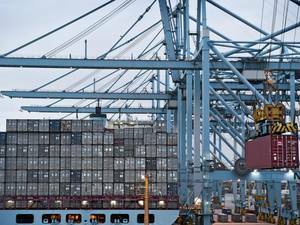 Under its new strategy, which includes the creation of an industry-wide blockchain-based trading platform, Maersk aims to expand its transport and logistics business in areas such as freight forwarding and trade finance. It wants to provide end-to-end solutions for customers rather than just shipping a container from port to port. Success of the platform depends on whether Maersk and IBM can convince industry players to sign up. Port operators in Singapore, Hong Kong and Rotterdam, customs authorities in the Netherlands, Saudi Arabia, Singapore, Australia and Peru, and container carrier Pacific International Lines (PIL) are among the companies and organizations that have joined the platform, Maersk and IBM said in a joint statement. The platform is still in the pilot phase and "is expected to be fully commercially available by the end of this year," they said. Blockchain technology powers the digital currency bitcoin and enables data sharing across a network of individual computers. The platform named TradeLens aims to help manage and track the paper trail by digitizing the supply chain process from end to end. More than $4 trillion in goods are shipped each year, and more than 80 percent of the goods consumers use daily are carried by the ocean shipping industry, Maersk said earlier this year.